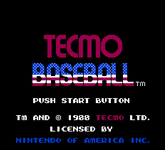 Tecmo Baseball is a video game developed by Tecmo for the Nintendo Entertainment System. Released in January 1989 for an exclusively North American market, it was a game for baseball. There were three modes for the game; one-player, two-player, and watch (zero-player). In addition to games between teams, there was also an all-star game with the best players in the game. The game has become very popular on college campuses. One of the major drawbacks of this game is that the pitchers become tired after only a few innings. There was a National division (comparable to the National League) and an American division (comparable to the American League, although both divisions only featured seven teams each. The National teams were: St. Louis, San Francisco, New York, Cincinnati, Los Angeles, Atlanta and Chicago. The American division teams were: Minnesota, Detroit, Milwaukee, New York, Boston, California, and Texas. All the players on the teams had names and statistics similar to those of real Major League ballplayers. A player on the Detroit team was named Arex but his statistics were those that Alan Trammell of the Detroit Tigers had in 1987. The best teams in the game were St. Louis and Minnesota, the two teams that also played each other in the 1987 World Series. Source: Wikipedia, "http://en.wikipedia.org/wiki/Tecmo_Baseball," available under the CC-BY-SA License.